Weight-conscious food lovers no longer need to deprive themselves of the ever-popular cuisine of Italy. 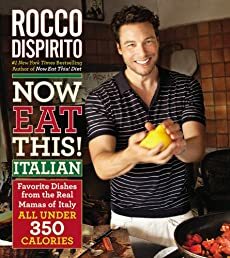 Award-winning celebrity chef and #1 New York Times bestselling author Rocco DiSpirito's latest Now Eat This! book is the solution . In his signature style, DiSpirito has recreated 100 classic Italian recipes to be healthy and low in calories and fat-yet still full of flavor. After travelling to Italy and perfecting the dishes side-by-side with the chefs who make them best-the Italian mamas-he offers sinful pastas, sauces, and desserts you never thought you could eat while keeping healthy, including: Spaghetti with My Mama's Meatballs, Mozzarella en Carozza, Chicken Parmigiana, Hand-Torn Pasta alla Bolognese, Sausage and Peppers, Classic Cannoli, Chocolate and Hazelnut Espresso Budino, and much more! NOW EAT THIS! ITALIAN proves that Italian food doesn't have to be calorie-packed to be delicious. All under 350 calories, these full-flavor, low-fat recipes are sure to indulge your appetite without packing on the pounds.